Trips for Kids (TFK) today announced a significant milestone with the formation of its first overseas chapter - Trips for Kids Israel - Samson Riders Bicycle Club (TFK Israel-SRBC). Located in Beit Shemesh, Israel, Trips for Kids' newest chapter provides disadvantaged Yehuda Plains youth a chance to experience the joy and challenge of mountain biking in nature, something they would not typically be able to enjoy. "The Samson Riders Bicycle Club is very excited to become part of the Trips for Kids family!" said Renee Halpert, communication coordinator for TFK Israel-SRBC. "Many children and youth from our region will reach new heights of success because of this important association." 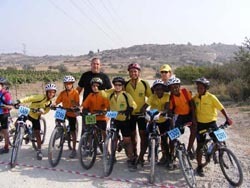 TFK Israel-SRBC was created on the foundation of the community group, the Samson Riders Bicycle Club (SRBC). One of SRBC's exceptional programs, Riding for Co-Existence, brings Israeli Jewish and Arab youth together to ride, learn about each other, break down social barriers, discover new interests and respect the land. "We believe that with the support of TFK, we can continue to expand this program to involve youth from these and other ethnic communities in the planning and implementation of rides for their peers," Halpert said. Across North America, and now in the Middle East, Trips for Kids chapters take low-income, inner-city and otherwise at-risk youth out of the city for mountain bike rides, which often turn out to be "the rides of their lives." A simple concept with rich dividends, Trips for Kids chapters have touched the lives of nearly 50,000 young people during its more than 20-year history. Trips for Kids' organizes mountain bike rides to help youth have fun while gaining confidence, riding skills, a greater appreciation for the natural world and exposure to the lifelong benefits of exercise. Each TFK Chapter is distinct, with different staffing and volunteer levels depending on the type and size of its program. Some chapters have been started by organizations like the Boys and Girls Clubs, Police Athletics League and cycling clubs. Several have evolved from public and private non-profit organizations committed to serving underprivileged youth, e.g. charter schools, treatment centers and public health agencies. While the communities served by each chapter are unique, the youth share a common need - they are low-income kids facing an array of personal challenges. For more information on Trips for Kids, including a list of chapters, please visit www.tripsforkids.org or call Marilyn Price at (415) 458-2986.